A couple of years ago, I told you about Muslims who brutally beat a gay Georgetown University medical student, and they made it clear that it was because he was gay. PUH-LEEZE. They’re “cooperating” because they got caught and want a lighter punishment for their crime. Try YouTube and jihadist sites. I’m confident you’ll find it’s hardly an isolated incident. Like, I said, Religion of Peace . . . unless you’re gay, a woman, a Jew, a Christian, a Hindu, an animist, an American, an atheist, a Westerner, wearing a bikini, wearing pants, a human, etc., etc., etc., etc. More Muslims in America . . . means more of this intolerance, violence, and barbaric Third Worldism. Maybe the news here is that Muslims have actually been charged with a hate crime. About time. How did they come up with the 50k to be free on bond? “Just three young men that misunderstand the teachings of Islam.” The MSM. Wonder what the MSM will do when the Muslim community starts agitating for their release ,an apology and money. That’s $150,000 in bail money. Just how did they come up with that? And speaking of GAY….Adult men playing with BB guns…and video taping it. The sad irony is many on the left that advocate for Islam would be the first to be persecuted under Sharia. @ bob – they couldn’t get AK’s, thus the BB guns. Seems a muzzie male just doesn’t feel “whole” unless he’s toting some sort of weapon. Just something for gays to consider since they are a target of the “religion of peace” goblins and trolls. Khomeini cleverly used leftists in his campaign to depose the shah. Once they were no longer needed, well, you can guess what happened. And yet, gays, feminists, leftist Jews, and other useful idiots continue to support Islamists. Blissfully ignorant, like sheep the day before Eid. Wow are we basing their religiion on their last names? Whose to say they AREN’T Chrisitans or maybe even agnostic or atheist? They are 3 stupid guys who did something thats been done to homosexuals by every race and religion since the beginning of time. They just happen to have Arabic last names. I don’t know who sounds more ignorant these 3 guys or the people who will spin this with no evidence that they are Muslims except their last names. & in words of John Wayne “We’ll remember you said that” Hope you’ll remember too when facts of the case become clear (although, as Ms. Schlussel has accurately stated, the facts are pretty clear) Actually not every faith has persecuted as violently homosexuals throughout history, not surprised you wouldnt know that. Dittos on Rocky Lore’s comment. Funny, how libs never ever once go after Islam. It’s called fear. Fear of what they’ll do to them as they’ve done to this SF victim. Really that’s your replay ….”well golly they sure sound Muslim so they must be the most extreme type of Muslim”? Wouldn’t that be much like saying your last name sounds German and you’ve got blue eyes and blond hair you must be a Natzi? If your going to call them Muslim make sure they are other wise your defeating you own argument. Do Mohammad Habibzada, Shafiq Hashemi and Sayed Bassam sound like Norwegian names to you? Please get real. Your NAZI line about Debbie might impress people at your mosque, but not anywhere else. You really do need to work on your taqqiya. It is lousy. Sorry so late in replying — just wanted to say the Nazi analogy only works if Nazis are out there committing thousands of atrocities every year IN THE PRESENT TIME. I’m pretty sure if these thugs weren’t Muslim, liberals would be demanding hate crime charges. For some strange reason, gay rights groups never seem to go after radical Islam like they do Christianity. That’s probably due to the curious lack of Baptist suicide bombers all over the world. So we equate copulation among men with killing Jews? Am I not getting something? I grew up in another world, and the more I read of my Bible, the more frightened I become. As a regular reader of your site who shares many of your concerns and views, I am also sometimes uncomfortable as a conservative gay man with some of your ideas regarding LGB folks (not that you don’t often have good reason!). I want to thank you for this posting – it gave me a much better understanding where you are coming from and I truly appreciate that while we may not agree on every gay-related issue, we share a common concern when it comes to individual rights and the dangers of a “sharia mindset” spreading in our country. I live in Hayward and would love to know where these guys live or which corner market their family owns and operates. It’s despicable that they are even out on bail. 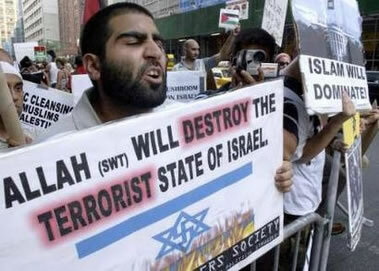 Muslim or not, these guys need to removed from the gene pool of humanity. It’s self loathing. Muzzie males are so sexually confused thanks to Islam, that they end up doing each other. Attacking gays assuages their guilt. Well I guess even dung has a benefit when used as fertilizer. Seems to apply here between Muslims and sodomites. Why thanks, Bill, for that telling comment. These Muslims, are they mocking Islam or promoting it..? Gay is an evil act and should be widely condemned. it undermines GODs purpose for mankind. To all Muslims, Muslim nations put together cannot defeat Israel the earlier you guys understand it the better.. Your Islam will only dominate in Islamic nations not in none Islamic nations.. Fools.. Destroying the World in the name of a religion which does not even exist. 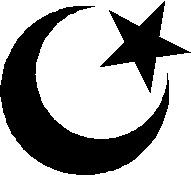 When a Muslim who claims to serve the most supreme God involves in an ungodly act such as gay what does it portray,….? When a Muslim cannot be himself, but instead impersonates a non-Muslim, what does it say about the Muslim? I heard there are no “gays” in IRAN…isnt that what the wacky muzzie leader said???? hmmmmmm…..he should know shoudnt he? Why is the person “Christian Nigeria” also writing as “ONE LOVE KEEP US 2GETHER”? 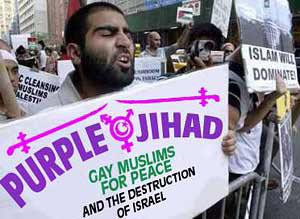 You know, as I’ve said before, I really do think it would be possible to peel many gays away from any sympathy with jihad. The hard leftists (which tend to dominate major gay organizations) are hopeless, but there are plenty of gays who would see the light. Many do in Netherlands, after all. This sort of thing really is necessary to avoid creating a movement that can be attacked as anti-democratic. Hi skzion- Good point. I am gay and I have zero sympathy with anything even resembling jihad. Just as I thought: the troglodytes admit they came to SF to attack gays. So not only are immigrant muzs almost invariably militant, they are almost always unemployed with nothing better to do than to boil over with anger at their kaffir hosts. Kudos for charging them with mayhem–they easily could have put an eye out for allah. What is up with the illustration? It looks like it’s Photoshopped. i really wonder what this page is supporting?! it is an anti-islamic und pro-jewish page? or is it just a detached view of things happening in the us??!! they didnt know that the guy was gay okay it was dark at the moment and they were far far from the man they “shot” how can they tell that he was gay? lots of people go shoot others wit bb guns and record it? its even on youtube? just because their muslim doesnt mean anyhting..without them we wouldnt even know algebra. they are good people i have lots of muslim friends and all they want is no violence just peace and freedom. not be known as terrorists! they have beards so what? they wear religious clothes..so what? its their religion! what if someone came upto you and asked you to take your cross off?..my point is to give them a chance their just like us nothing more to be said…all you news reporters dont even know the whole story so you just make one up. ALL religious people should be offered a chance to live in peace (give up your religion) or be slaughtered. Don’t forget that religion is faith based, this includes fascists/conservatives and even those pathetic neoliberal bullshitters.